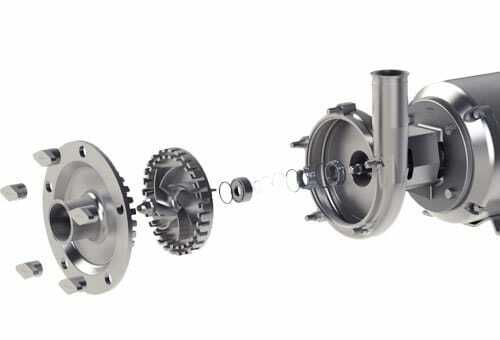 Ampco Shear Blenders are perfect for inline mixing of premixed products, and they can also be used to minimize undissolved particles or achieve the specified final mix. The clearance of the Ampco SB Shear Blender can be adjusted from 0.3 to 1.2 mm (0.01 to 0.05 inch), so only the minimum necessary shear is applied to the product. This reduces damage, prevents overheating, and lowers power consumption. When the highest possible product shear is required, the SBH Shear Blender offers tightened clearances, forcing the media through several shearing stages. This improves the solution quality by reducing the size of crystals for quicker solubility. The Ampco SBH ensures smoother product consistency and texture, uniform blending, and repeatable mixing results in all processes. Ampco Pumps Company has been providing quality pumps worldwide for over 60 years. Ampco offers a complete line of positive displacement, centrifugal, and twin screw pumps. The SB and SBH shear blenders can be used with ingredients such as stabilizers, thickeners, gums, sugars, and other additives. Product is fed to the SB Series shear blender from an upstream supply pump. As the product enters the casing, a series of rotating teeth in close tolerance to stationary teeth shear the product to a desired level before exiting the casing. Depending on the version of SB equipment used, the product may go through a single stage or multiple stages of shear before exiting. This creates a smooth, homogeneous product that can be used for further processing or sent off to be packaged. Literature for SB/SBH Shear Blenders have been saved to your dashboard! Literature for SB/SBH Shear Blenders are already in your dashboard.